Adam was the first man on Earth. Everyone knows. 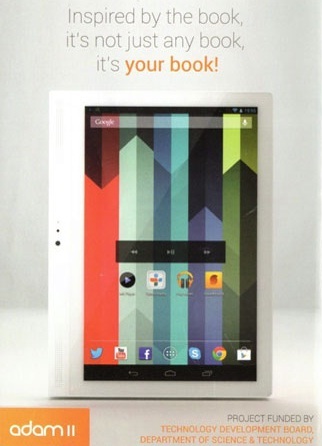 But Adam was the first tablet by an Indian startup in Bangalore Notion Ink. Hardly anybody knows. But with Adam II, they have a very strong point in place. A tablet that exceeds expectations. At-least on paper. So, what does Adam II have that will make it such a buzz in the market in the coming months. Well, for starters it gives all the standard Tablet features that should be available for Rs 12,000. A Jelly Bean Android OS 4.2.2. A 10 inch display. 2 Mp Rear camera and all the standard connectivity options in the form of 3G, Wifi, GPS and USB connectivity. Let us really look at what is unique about this. A 1280 x 800 display. A 1.5 GHz processor and a Super twisted Nematic secondary display unit. Well, Notion Ink has indeed pulled out a few stops to bring this tablet to everyone’s attention. It also features a better than expected battery at 6000 mAH, which should be expected to last more than 6 hours in use. Notion Ink, a technology startup by two IITians, Rohan Pandey and Rohit Rathi, is funded by the Technology Develpment Board. Adam II was launched amid huge media publicity on 11 May in Vigyan Bhavan in Delhi on the occasion of National Technology Award Ceremony. It is expected to hit the market in the next month but despite assurances by the Government and a lower price tag than expected, it remains to be seen how the device performs in the users hands. If you have used this product or would like to add some view of yours, feel free to comment below.